Students have so much more fun reviewing concepts when it’s in a race against time, don’t you think? Today I am sharing a new game my students have loved this semester – a matching game for 5 Finger Patterns! When you print off the downloads below, you’ll have two sets of cards – one with all the names of Major & minor keys, and a second set with the visual white & black keys of each pattern. I printed mine on white cardstock and laminated them so we could use them over and over. 1. “How many can you play in 1 minute?” Draw from the first set with all names of Major & minor keys while sitting at the piano. See how many the student can play correctly in 60 seconds. 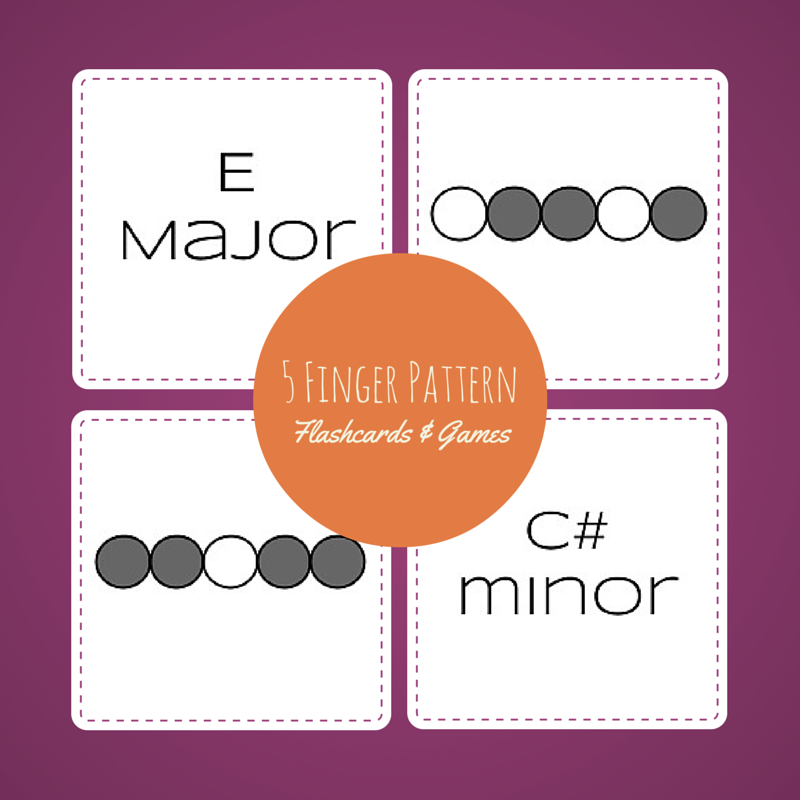 You could also use only the Major or only the minor key cards to review those concepts before mixing them all up! 2. “Matching 5 Finger Patterns” Set out all of the flashcards. For a single student, keep them all face up but mixed up so students may search to find each set that goes together. For a group class, we set up a matching game with each set of 24 cards turned face down on two sides of the table/floor. With students divided into two teams, we take turns turning over one from each pile for a turn and see how quickly they can get the most sets matched up. For a quicker game, you can always just use the Major or minor cards in either of these games as well. Students may want to run back and forth to the keyboard to check the visual patterns so be prepared for that. Having a game that makes them think about the notes away from the keyboard forces my students who play more “by ear” to carefully remember the patterns of half & whole steps that make up 5 finger patterns. Hope your students have as much fun with this as we have had here! Olympic Bingo - Piano Style!